After two years of planning, the Full-Circle oral history recording project finally took flight in late September 2014, uniting the University of Hertfordshire and the University of Western Australia in Perth. During an intensive week, teams of students from each university interviewed British ex-pats, widely ranging in age and background, living in and around Perth. Questioning focused on the total emigration experience, from the decision to head for Australia and the journey out, to the settling-in process and the continuing relationship with family back in the UK. The interviews conducted in 2015 and 2016 are featured in the Oral History Archive which tell the story of the family members left behind. Full-Circle was hatched in 2012 by UWA's Professor Jenny Gregory and Andrew Green, Senior Visiting Research Fellow at the University of Hertfordshire. 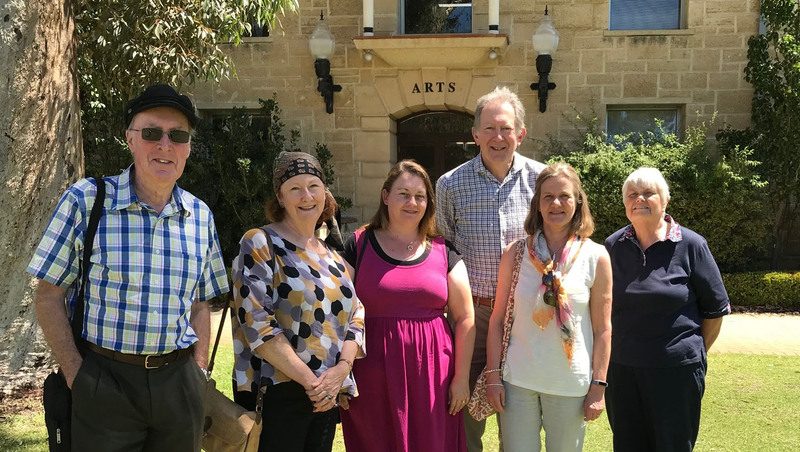 The organising team in Perth included UWA staff members Lucy Hair and Brenda Dagnall, while Andrew Green was assisted in the UK by Professor Owen Davies, together with Anne Murphy, Katrina Navickas and Jeremy Ridgman, Head of the University of Hertfordshire, School of Humanities. Andrew Green was joined by the distinguished ABC oral history broadcaster Bill Bunbury in conducting training workshops for around forty UWA students who had volunteered to take part in the recorded interviews. A media campaign, including a high-profile radio appearance by Jenny Gregory, led to around a hundred ex-pats coming forward, willing to share their memories. They were immaculately timetabled by UWA staff and students into an evening and a day of interviews on the university's Crawley Campus. Meanwhile, three University of Hertfordshire students - Helen Tyler, Gemma Fulton and Joshua Edgcombe - travelled out to Perth to conduct their own interviews across six days, both around the city and in the area to the south. This resulted in more than fifty additional recordings, including those featuring various ex-pats found by Bethanie Group, a major provider of residential care and housing for the elderly in Western Australia. The picturesque surroundings of the University of Western Australia's Crawley Campus in Perth formed the backdrop for a major milestone in the Full-Circle oral history project - conceived and managed jointly by UWA and the University of Hertfordshire. Full-Circle gathered the stories of migrants who made the long journey to Perth and then from members of their families who remained in Britain - completing 'full-circle' family narratives. On March 1st, UH research fellow in oral history, Andrew Green, handed over sound-files of around 90 interviews conducted in the UK and in Perth by our students and staff. These interviews complement some 70 interviews conducted by UWA students in the Western Australian capital. Overall, a mammoth archive which is already being mined for research and podcast purposes. All the interviews will be shared with the internationally renowned Battye Library in Perth. The handover followed a celebratory lunch at Crawley Campus's University Club, attended by UWA's Professor Jenny Gregory (who developed the Full-Circle project with Andrew Green) and Lucy Hair, Research Coordinator of UWA's Centre for Western Australian History. Also present were legendary Australian oral history broadcaster Bill Bunbury, who trained UWA students for the project alongside Andrew Green. Representing those interviewed during the project were Bill's wife Jenny, Peter King and Diana Green. Listen to the full recordings by visiting the Full Circle Oral History Archive. Find out more about the experience from the University of Hertfordshire students' diaries.